GRAPEVINE, Texas — Goodyear Tire and Rubber Co. said its recently introduced steer tire addresses concerns that fleets expressed with an earlier model designed for the same application. The Akron, Ohio-based company launched its Endurance LHS in mid-2018 and said during its annual Goodyear Customer Care Conference here Jan. 27-30 that the tire’s design will help it outperform earlier steer tire models, which some in the trucking industry complained suffered from premature wear. 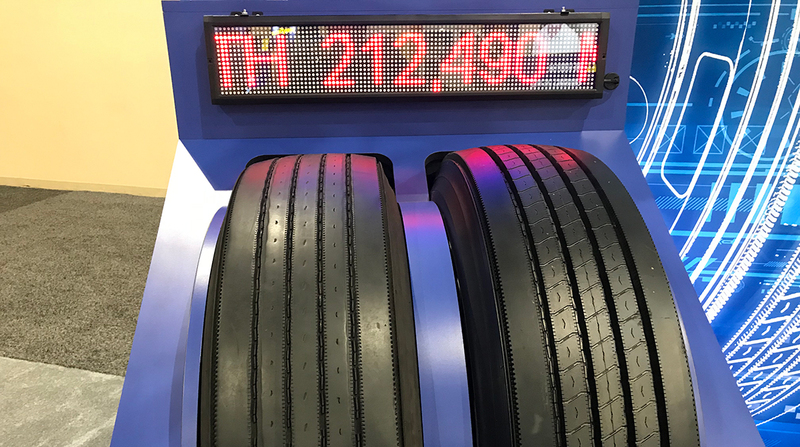 During more than 13 million miles of developmental testing with fleets, the new tire delivered an increase in wear range of up to 25% when compared to the G399A and other steer tire models, according to Goodyear. The new Endurance LHS is intended to replace the G399A. The company said the tire has several new design features that target not only longer life, but also increased fuel economy. They include a new cap-base and tread combination to help extend mileage before removal as well as lower rolling resistance. The Endurance LHS also has a new sidewall compound to help lower rolling resistance and boost fuel efficiency. The tire’s steel-belt package is designed to improve casing strength, while its “shoulder wedge” was developed to help stabilize the belt package and improve longevity. Goodyear does not discuss pricing outside of its dealer network, but the Endurance LHS is priced between $575 and $675 on several online tire sites. The tire is available in sizes 295/75R22.5, 11R22.5, 285/75R24.5 and 11R24.5 — all in load ranges G and H.
The company also said that its current longhaul trailer tire, the G316 LHT, eventually will be replaced by another model in the Endurance lineup. For now, the G316 LHT is its trailer position tire that works in concert with the Endurance LHS and Endurance LHD models.